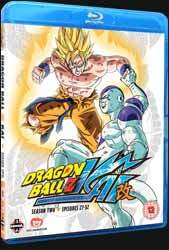 Dragon Ball Z Kai is a revamp of the original Dragon Ball Z series with various changes made so that the show, among other things, better followed the original manga. The new version also sports a new HD print as well as a new audio track for both the music and the vocals and changes opening and closing sequences. The Kai in the title translates as ‘updated’. The original Dragon Ball seasons had a nasty habit of not concluding their whole and complete arcs, so season two continues with the Namek storyline. The final battle is now truncated, which is better than the original, but don’t expect to see a conclusion in this set. Last time, for season one, the review of the show was on the DVD, this time, for season two, we’ll be looking at the Blu-ray release. The episodes are spread across four discs. Disc one has episodes 27 – 35, don’t worry about the numbering, Japanese shows invariably jut continue the numbering system from one season to another. Disc two has 36 – 39, less than the first as disc two also contains some extras. There is a US Cast Interview (7 min, 26 sec), some trailers for other shows as well as the show's textless opening (1 min, 27 sec) and closing sequences (1 min, 02 sec). Disc three contains episodes 40 – 48 and the last disc has episodes 49 – 52, with some more extras, in the form of the opening (1 min 27 sec) and closing songs (1 min 02 sec) and more trailers. Well colour me unimpressed. I guess most of my objections are the same for season one. Ok, so the new print removes all of the filler and tries to give you something which more closely follows the manga story. True, they have tarted up the print and included new sequences and special effects where they can, but the transition between the old and new material is occasionally quite jarring. The original was never destined for a high definition format so it looks soft compared to the new material. I’m not even sure that the overall quality really required it to be released on Blu-ray. The audio options for the Blu-ray release are for either Dolby TrueHD: English 5.1 or Dolby TrueHD: Japanese 2.0, with optional English subtitles. Which you choose is going to be very much a personal choice. The English dub is good and has the superior sound separation, whereas the Japanese may appeal to the purists as it reunites as many of the original vocal actors as possible. Having gone to all the trouble to make so many changes in the show, I’m very surprised that there are no extras explaining the reason behind it. If nothing else it might have gone some way to persuade the fans to buy something which essentially they already own, it’s not that hard to just not play the filler stories.